Wow. What a fantastic book. I could not put it down. I’m not really an avid reader of history or war books, but was travelling in Cambodia at the time, and had read lots of books about that country, when I decided a dose of Vietnam war would help with context. I have no idea how I found this book. But boy am I glad I did. It is a fascinating story with wonderful characters from beginning to end. The shocking futility of war, and the damage that is causes, made whole only by the enforced camaraderie that such an environment creates is a study in human nature that is brought to life incredibly vividly in this book. 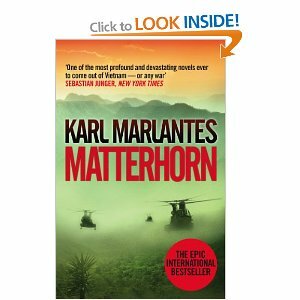 Reading this at a time when America and the world are again fighting a war that feels as futile if not more futile than the one that Karl Marlantes was sent to fight makes it hugely poignant. Replace the wet jungle with the dry dunes, the Viet Kong with the Taliban and you have, once again, a terribly sad carbon copy of events that have happened before, just with a different set of characters who will be just as badly and permanently affected and damaged as those that came before. Its incredibly sobering reading this book. I came out of it with a completely new respect for the poor men and women we send in to fight our wars. Who shoot at each other with practically no real knowledge of why, and certainly no knowledge of who. How can they? That would humanise the whole thing, and make it a job no one could or would do. And so the biggest single thing that this book will leave with you is the irrefutable knowledge that it is IMPOSSIBLE to win a war against an enemy who cares more deeply about the outcome than you do. A more motivated enemy. One that is defending its way of life, land, culture, whatever and wherever that may be. Don’t read this book if you prefer not to know what happens when you try. I gave it 5 our of 5, but probably would have given it 6 if I could.